Journalists Jeff Canoy and Val Cuenca captured in words, still and moving images the plight of Marawi residents caught in the middle of the on-going armed conflict in a special report published on news.abs-cbn.com last July 5. In the article, “Buhay Pa Kami: Dispatches from Marawi,” Jeff weaves five stories into one narrative about how Muslims, Christians, fathers, mothers, and ordinary civilians survived days of terror in the Islamic City of Marawi. Jeff and Val’s fellow journalists also commended them for bravely covering and telling the stories of fellow Filipinos affected by the war. Other reporters like Kori Quintos, RG Cruz, and Gigi Grande, and even celebrities like Angel Locsin also encouraged others to read and share the story. Jeff and Val have been in and out of Marawi along with other ABS-CBN News journalists to tell the stories of people involved in and affected by the conflict. Like fellow ABS-CBN News journalist Chiara Zambrano, Jeff’s social media posts and reports on the armed conflict have been shared around social media by netizens hungry for news about our countrymen in Marawi. They recently recounted their experiences while in the war zone in a special episode of the award-winning documentary series “Mukha” on ANC, the ABS-CBN News Channel. Viewers can watch the episode on iWant TV or “Mukha’s” official facebook page: https://www.facebook.com/MukhaTV/. 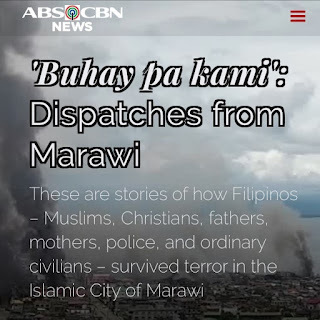 Meanwhile, “Buhay Pa Kami: Dispatches from Marawi” is still up on ABS-CBN News at http://news.abs-cbn.com/specials/dispatches-from-marawi.